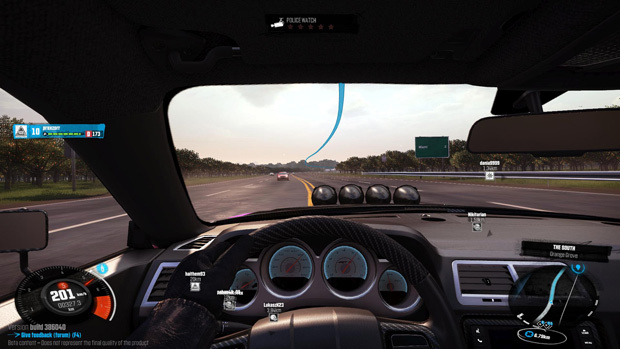 A few weeks ago a select group of people were invited for beta testing of the new upcoming racing MMO, The Crew. 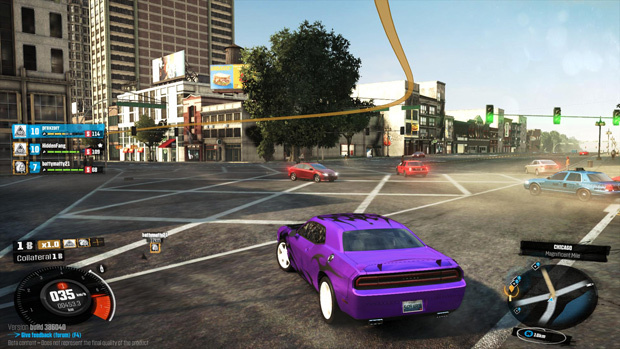 In this game you will be encouraged to play together with other people because unlike other racing games, The Crew takes place in an open world representation of the United States. 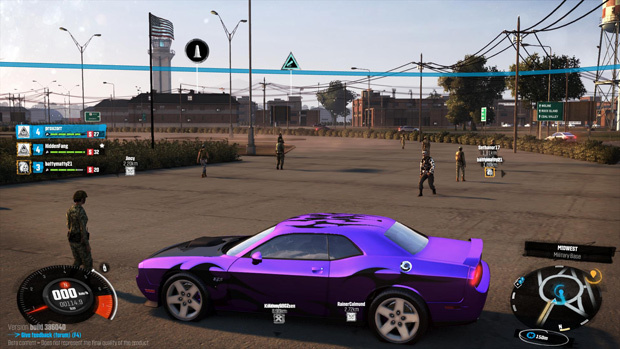 As such, The Crew is pushing beyond the standard lobby based racing title by allowing you to cruise around the largest map ever brought to the genre in a never ending quest to build up your wealth and garage of supped-up vehicles. Before you get to pick your own ride, you are first put into a few story missions that introduce you to a rather accurate recreation of North America. Before I explain what happens next, I do want to remind everyone that when I played this game, it was still in an early beta state, needing much work to realize the goals of its official release. The storyline is very straightforward and matches the likes of a Need for Speed title. You get caught by the FBI, and then strike a plea deal to work as a spy to exonerate yourself. 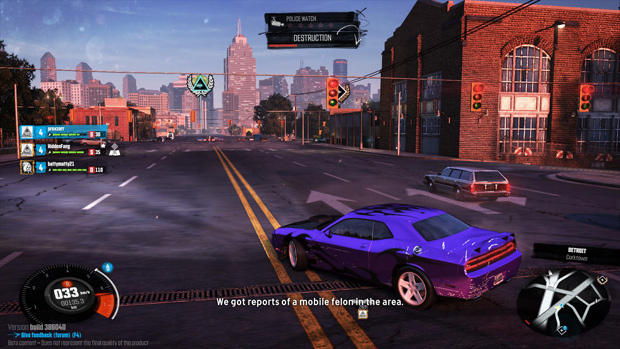 The Crew isn’t a game you play because of its rich story line that’s for sure, as the player driven story between rival crews is the true story players will be following. After a couple of missions you are given a choice between a few starter cars. For me these were mostly muscle cars and lacked any real variety. Statistically they had some key differences such as one specializing in top speed, another in acceleration, and a third in handling. Overall early races will be determined by your individual skill and not picking the car that best lines up to a track’s challenges. Though if you truly must min-max cars to match your natural skills, then a garage test drive option exists to try before you buy. I knew I would be moving on to bigger and better vehicles though and just grabbed one on a whim to rush towards the main world. My driving style matches the same one Jeremy Clarkson likes to use, the good old fashioned SPEEEEEEEED. Cars are fun, in the real world many people can get sucked into tuning their own 4 wheeled vehicle and I can see why. It’s a labor of love that I don’t want to put the physical effort into doing, but in the virtual world I go full throttle to pimp out my ride. 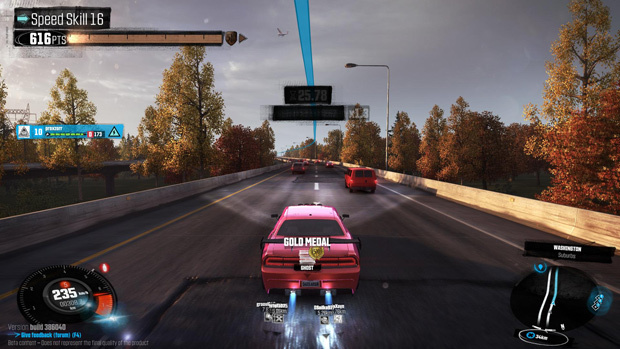 After all a race can be lost before it even begins if you don’t put the effort into the RPG elements of The Crew, so don’t slack on upgrades and modifications. The Crew allows you to tune almost every aspect of your car. While the choices initially are few, just about every change will noticeably impact the looks of your vehicle, making your power all the more intimidating to would be opponents. Currently The Crew starts you off with far more cash than you need to buy your first car, letting you get a taste of the garage customization whenever you’re ready to put the time in. As you complete missions and skill challenges, further part options unlock to allow you to tweak the less common pieces like breaking and handling. We’re halfway through this article, and I have only talked about how awesome it is to tune your car. Time to move onto the gameplay itself. First off I can’t stress enough how much effort was put into recreating signature regions of major cities and signature landscapes around America. Even for someone that hasn’t been to the States before, it is really awesome to find similarities that you have seen before in movies or pictures. As such I spent most of my first gameplay sightseeing rather than hunting missions and objectives. The missions were fun, but basic. The current beta only had content populated up to level 10, roughly a couple hours’ worth of gameplay for a focused grinder mentality. What is present is though is solid, but the open world aspect of exploring and randomly running into other drivers was a far greater selling point in my eyes. Together with a group of friends we made a Crew, and decided to check out all the different cities and areas around the map. We went to the Big Apple, Miami, Grand Canyon, Las Vegas, the west coast and many other areas around the map and never lost our sense of wonder at the scale of each. For example the Grand Canyon wasn’t just a simple canyon themed bumpy off-road track, but rather a monumental landmark that took a couple hours of driving to say we had explored it fully. Granted we were by no means an organized unit and spent most of those hours stopping for screenshots or trying to bump each other off the road. And it never felt boring. The driving is… special. Hard to describe well in words. 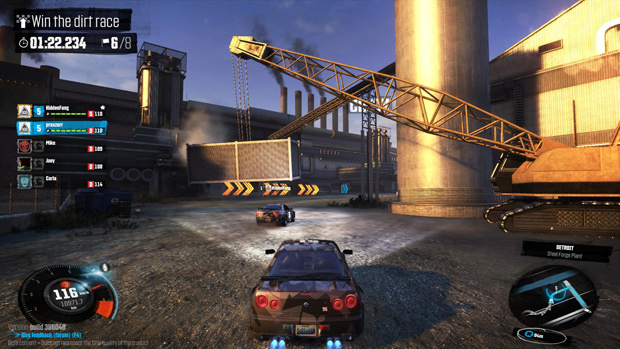 The Crew offers different modes of control, some adding more realism or making it feel like a real sports car, and each catering to a different user’s expectations of a racing game. My only concern is if anyone will actually use the more realistic controls since the added difficulty punishes you and makes it less likely to win races, slowing your progression as a result. But for challenges between friends I certainly see each style getting some use. 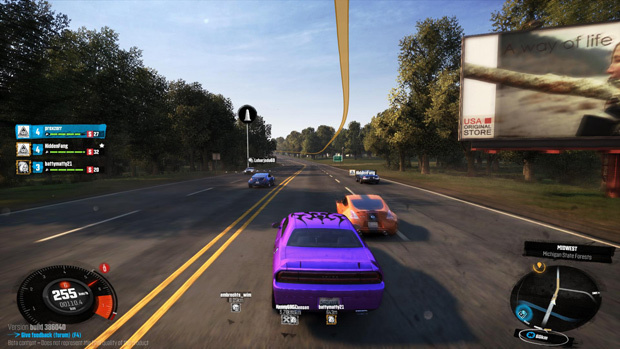 While doing the missions, you get the choice to race against the computer or try to invite other players in your instance. You see, while playing the game you are put in an instance with people around you. Since the map is insanely big for a racing game, this is made to make the overall experience a lot more fun, but unfortunately this makes doing the missions lack something. Inviting people in your instance is not enough. I prefer to have it search people in a more global way so you have a faster way of finding other, random people to do the mission with. The missions themselves offer a variety of types with some seriously chaotic challenges. In addition to typical racing scenarios, I faced cop chases and even taking out a targeted vehicle. Overall they felt arcady, emphasizing fun gameplay when shared with other players. If proving you are the best is more in line with your idea of fun gameplay though, ranked PvP race battles exist. These battles are played on racing tracks that resemble areas in the world. Because of this there is a wide variety of maps and race tracks. At this level of the game, having a variety of kits for different terrains will be necessary to stay competitive across a full nation of race track possibilities. A public ladder ranking indicates the best racers on the server, and here’s hoping they do something similar for Crews as a whole. 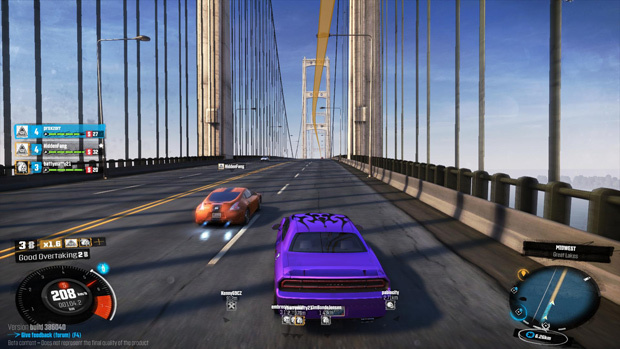 The Crew gives you the pleasure of being a solid all around racing game. 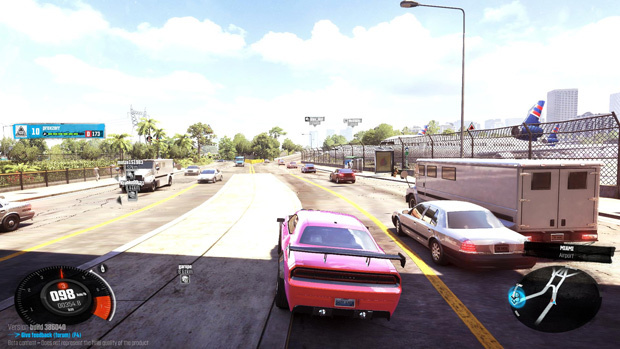 Because the game is an open world game in the style of an MMO, it caters to social gamers as well as your typical racing junkies. If you don’t feel like doing the missions and racing, you can go sightseeing and there is a lot of that. The world feels alive, sadly more so than recent Grand Theft Autos that I have seen. While driving around I have seen the world as a living being, in the countryside I have seen people sitting around in their gardens, relaxing on their beach, or doing something else in their gardens. And the same can be said inside of the cities. The realism offered here blows its competition out of the water, while maintaining beautiful vistas that don’t hinder gameplay with much graphical lag. While the buy to play model makes an open beta unlikely to happen, it’s certainly worth putting the effort to try to get into a closed beta test before launch. 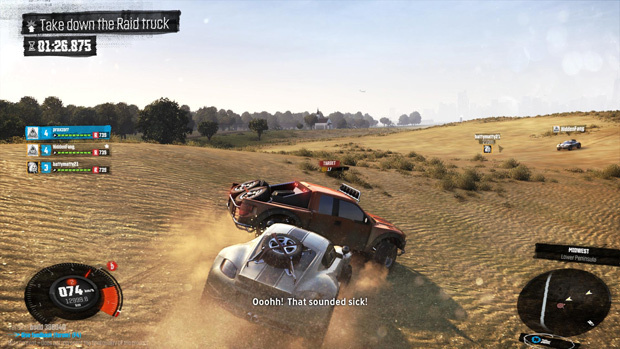 The Crew is an absolutely amazing experience for any gamer or car fan.